BOSTON — Wynn Resorts removed its security chief after he acknowledged spying on a former employee following allegations of sexual misconduct against company founder Steve Wynn came to light. 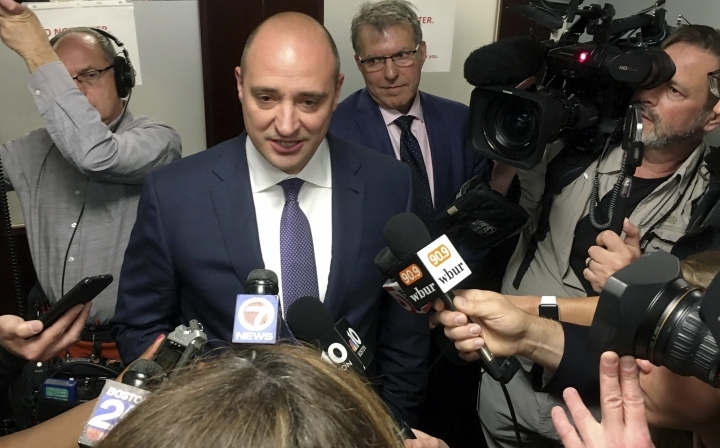 CEO Matthew Maddox said James Stern, the executive vice president of corporate security, was informed Saturday the company would "no longer require his services," according to a lengthy legal brief to the Massachusetts Gaming Commission released Tuesday. Stern told the commission last week he'd surveilled company co-founder Elaine Wynn and three employees, including one named in The Wall Street Journal's 2018 report about the misconduct allegations. Steve Wynn has denied the sexual misconduct allegations. The gaming commission, following last week's hearings, is deliberating privately on whether Wynn Resorts is still suitable to hold a state casino license as it plans to open the $2.6 billion Encore Boston Harbor in June. A written decision is expected later. Stern, a former FBI agent, testified he'd sent undercover operatives to monitor current and former employees, including former Wynn casino stylist Jorgen Nielsen, who was a named source in the Journal's January 2018 story. It's not clear who the other two persons surveilled were, but, in its Tuesday memo, the company stressed that neither Nielsen nor the others were victims of Steve Wynn's alleged misconduct. The company also said Stern's surveillance of Elaine Wynn, the ex-wife of Steve Wynn, happened around 2012 and stemmed from an unrelated lawsuit brought by Kazuo Okada, a Japanese billionaire and fellow Wynn Resorts co-founder. Elaine Wynn told regulators last week she disclosed to company officials in 2009 a $7.5 million payout Steve Wynn made to a female employee who'd claimed he'd raped and impregnated her. But the spying revelations shouldn't reflect negatively on Maddox, the company argued in its 49-page memo, which also covers other issues and concerns gaming commission members raised about what Maddox may have known or done about the misconduct allegations. Maddox, who took over as CEO last February but had been a close confidante of Steve Wynn for years, had only "minimal" and "partial" knowledge of the spying, the company maintained. And, going forward, it said surveillance work will be approved by the company's chief global compliance officer and its general counsel.